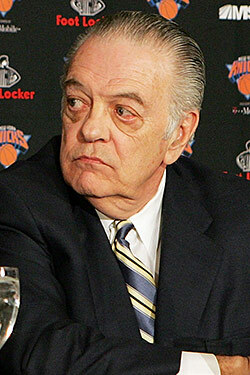 Donnie Walsh knows it'll take a package that includes a first-round draft pick to acquire Carmelo Anthony. ("I need to go out and see if I can get one," he said yesterday.) And he knows the reason he doesn't have one to offer until 2014 is because he traded his 2012 first-rounder to Houston in the Tracy McGrady trade/Jared Jeffries salary dump. (NBA rules prevent teams from trading consecutive first-round picks.) Says Walsh, about that trade: "I didn't like doing it. The night before, I felt, 'I don't like doing this, but we're going to do it.' I'll second-guess myself." But if we may third-guess Walsh — that's a thing, right? — it sounds like he's being too hard on himself. Look, the plan all along was to go all in for LeBron, and clearing up space for a second max free agent was part of that plan. In hindsight, LeBron taking his talents (and Chris Bosh) to South Beach makes that look ill-advised, but at the time, the consolation prize looked to be one max free agent (which turned out to be Amar'e Stoudemire), and enough cap space to go after Anthony next summer. Which isn't so bad, and for all we know, still might happen.